I wish I were more of a salad person. Don't get me wrong, I love a great salad, but I'm never that inclined to make one for dinner. Lately, I've been trying to be more conscious of this salad need and have been making a salad for dinner once a week. Okay, let's face it ... I run out of time in my day and decide to take 10 minutes to chop vegetables, make a dressing and call it a day! Regardless of the reason, we are getting more salads in our diet. Years ago, I got a small recipe book on tempeh. Over the past three moves it has gone missing, probably never to be found (by me) again. I don't remember much from the book, but I always think about seeing a recipe for tempeh croutons. 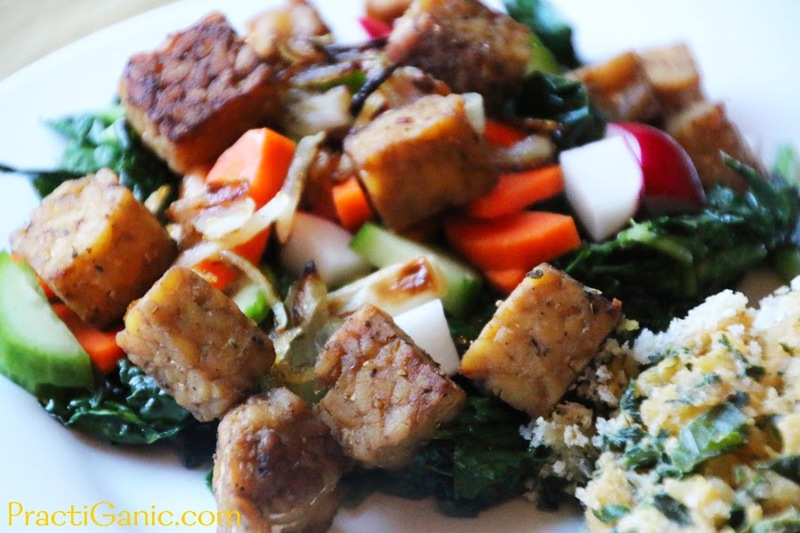 Since I am a total carb freak, I love croutons on my salad, but never got the push to make them out of tempeh. Curiosity finally got the best of me and I decided to make them for last weeks salad. Not only were they really easy to make, but they made me want to eat salad again the next night! The kids even munched on one or two and I never can seem to get them to eat tempeh! Cut tempeh into 1/2 inch cubes. In a bowl, mix remaining ingredients to make your marinade. Marinate tempeh for at least 1 1/2 hours, but the longer you do it the better flavor it will have. Remove tempeh from marinade, reserving the marinade. Place them on a sheet tray and bake at 375º for 40 minutes, tossing every 10 minutes. Once done, give one last toss in the marinade to get even more flavor. Top on your favorite salad.